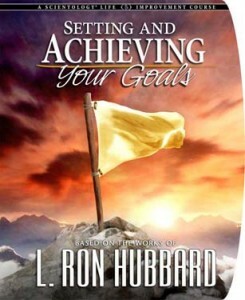 When you know the Scientology principles for setting and attaining goals, you can make even your wildest dreams come true. Without goals and aspirations you can feel lost in life. People who are not actively working to achieve an objective are unhappy. They are subject to all the stress of modern living. Yet all too often, people set goals and, despite making an effort, fail to attain them. Why is this? What is the solution? The Setting and Achieving Your Goals Course answers these questions. It shows you how to set a goal and gives you the precise steps to achieve it. The breakthrough discovery of the administrative scale—a graduated scale based on natural law that shows you how to formulate goals, purposes and plans. Why people sometimes work hard to reach a goal but make no progress attaining it—and how you can change that. How to subdivide a plan into short, doable steps so you reach the goals you have set—no matter how big they might be. With the tools you will learn on this course, you can formulate, plan out and accomplish goals that were previously only a dream. “This was a great course. Before it was always hit or miss on my goals with no understanding of why. Now, after doing this course, I can look back and see exactly what happened. I also now know how to keep things in my life moving on this current upswing I am experiencing. My goals have never been clearer and felt so easy to obtain.” S.D. “This course clarified so many things for me. The technology was a breakthrough since, in the past, goals and the way I want things to be were distant and unattainable. Now I have simple, real-world technology to create what I want.” V.J. “I actually feel a little silly about how I have been approaching life. It actually isn’t hard to take control and achieve any goal. This course made that abundantly clear. Now it is time to get moving and use it.” R. S.